Regiment/Catrawd: 16th Bn. King’s Royal Rifle Corps. plus a 6 year old nephew Wallice Edge. Stanley himself was recorded as being a 20 year old apprentice pawnbroker. Stanley’s Army Service records have survived and are accessible on www.ancestry.co.uk. They are not in wonderful condition but they allow us to follow some of his story. He enlisted and signed his Attestation Papers in Chester on the 2nd October 1914. His occupation was ‘Manager to Pawnbroker’. He was medically examined and the following description was noted. He was 5′ 6″ tall, weighed 122 lbs and had a chest measurement of 35 and a half inches, with a 3 and a half inches expansion range. His complexion and hair were fair and his eyes were blue. His physical development and eyesight were deemed to be good. He had a tattooed dot on his left forearm and a scar on the right side of his neck. He was considered fit for the army and was allocated to ‘the Church Lads Brigade’ which came under the umbrella of The Kings Royal Rifle Corps. ( For more information see http://www.clcgb.org.uk/documents/historical-group/194-brigade-factsheet-13-the-16th-battalion-krrc/file). His mother Harriet was his Next of Kin. The Records tell us that he served ‘At Home’ (in the UK from the 2nd October 1914 until the 15th November 1915 and that he served in the British Expeditionary Force in France from the 16th November 1915 until his death on the 6th November 1916. 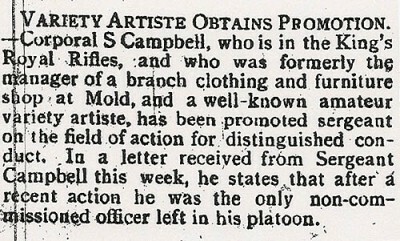 He was promoted regularly – to Lance Corporal 11 May 1915, Corporal 24th July 1916, Lance Sgt 2nd August 1916, Acting Sergeant 16th August 1916 and confirmed in rank as Sergeant the same day. The records include internal army correspondence and communications with Stanley’s Mother concerning his personal effects, medals and commemorative plaque and scroll. After his death his mother received his Post Office Savings Book, registered at Mold Post Office.